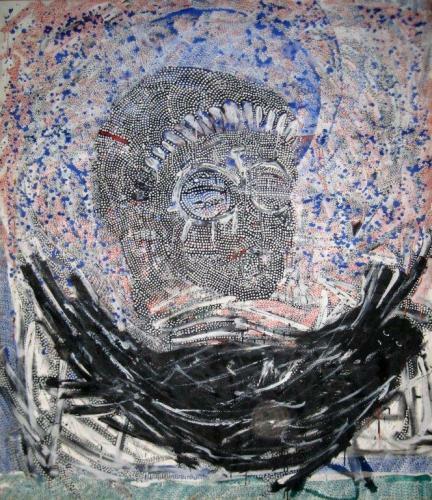 Mohammed Taha Hussein is still one of the most important artists of the Egyptian Contemporary Art. Now 86 years old he can look back on a very rich and exceptional varied oeuvre. In all these decades, his art has lost none of its vitality and its force. 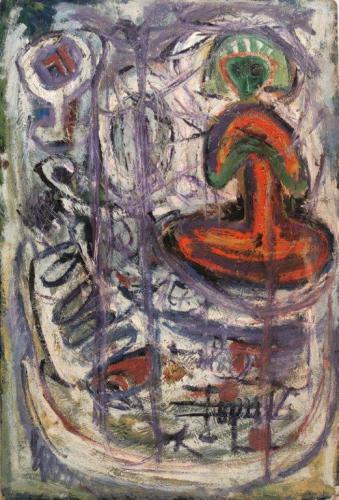 Characterized by a fruitful symbiosis of traditional Arabic-Islamic culture with the ideas and techniques of Modern Western Art the work of Taha Hussein makes a major contribution to the understanding between the Eastern and Western cultures until today. 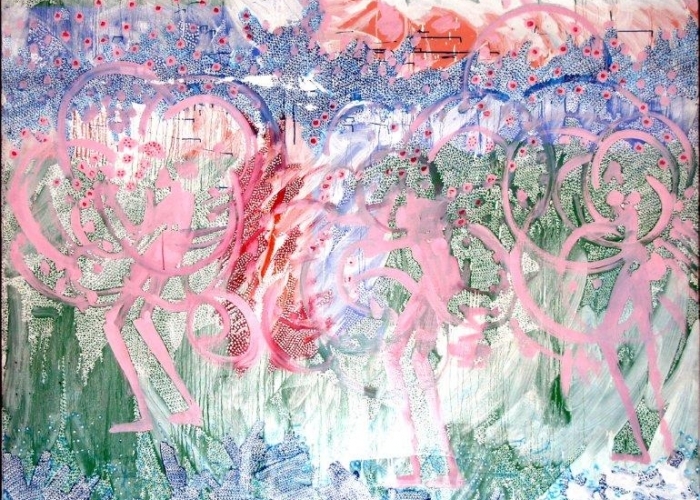 His art reconciles the so sensitive relationships between the oriental and occidental societies, which have been brought into focus of intercultural relations since September 11, 2001. 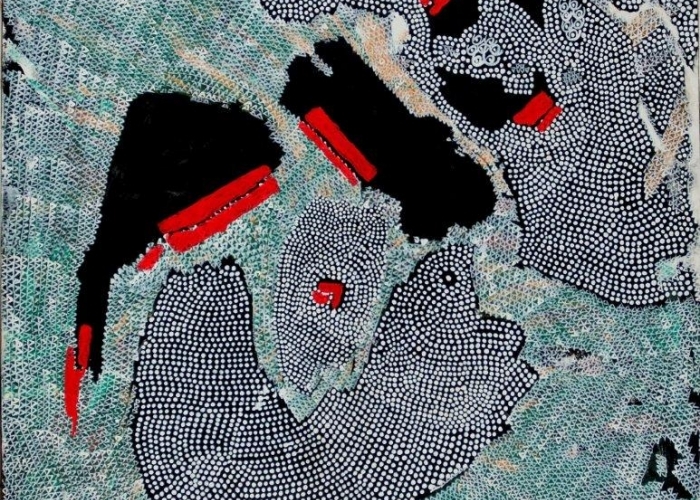 Even by the recent revolutionary movements in the Arab countries – the so-called “Arab Spring” – his art with its interplay between oriental and occidental pictorial forms and structures has opened up an entire new powerful political meaning. Mohammed Taha Hussein’s latest series “Pulsatio” embodies a dynamic and a life-affirming power, which reflects impressively the inexhaustible energy of the artist. The pictures seem to speak about an inner struggle which deals with the burning questions about the future of his native country Egypt: Where does the land of the Nile go from here? The “Arab Spring” has changed the country considerably. The hope that the obsolete political structures will change and that the social conditions will improve took the people to the streets demonstrating for their rights. Taha Hussein, who lives not far from the Tahrir Square, experienced all this firsthand. Thus, the series “Pulsatio” becomes the importance of a contemporary witness: it seems that the artist Taha Hussein describes in these paintings his personal impressions of the political upheaval in Egypt of recent years. In his art this is shown in an enormous concentration and compression of the distinct pictorial elements and in powerful and expressive colours. 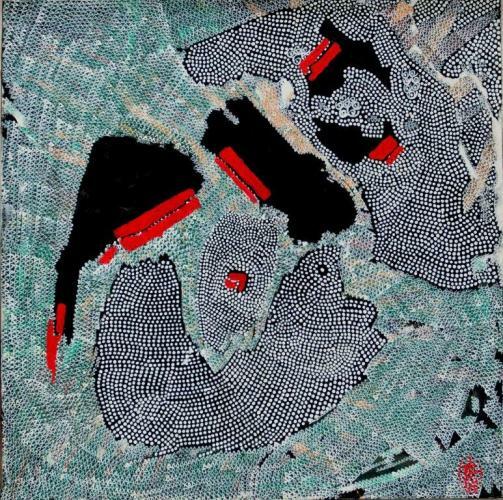 The small-size abstract structural pattern that has become significant for Taha Hussein’s work since the 1980s, covers the entire pictorial surface and evokes movement and a pulsating rhythm in the painting’s structure. In context with representational motifs and calligraphic characters which is visible as Arabic script only in the drawing style, Taha Hussein generates in this series a dynamic which can be almost felt physically. 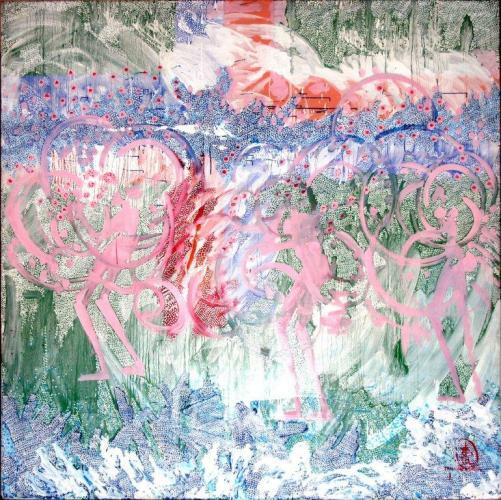 The paintings produce an atmosphere that is charged by unrest and rebellion. Seismographically like the pulse, which describes the frequency of heartbeat and therefore the heart activities, they reflect the political upheavals in the Arabic world, but even more the Egyptian re-awakening. 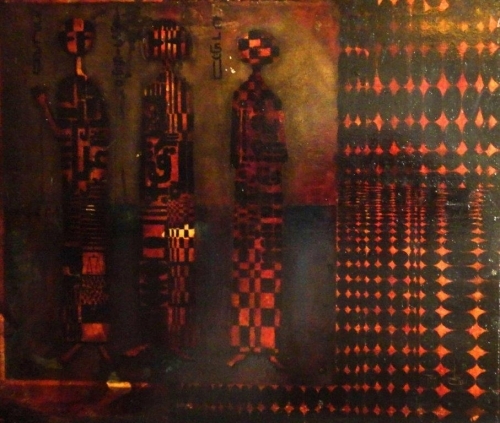 Mohamed Taha Hussein (1929) is a leading personality of modern art in Egypt. After a figurative phase in the 1950’s, he studied at the Fine Art Academy in Dusseldorf in Germany, and became personally acquainted with the artists of the ‘Zero’ group, including Gotthard Graubner and Heinz Mack, who each told me they have fond memories of meeting Taha Hussein. 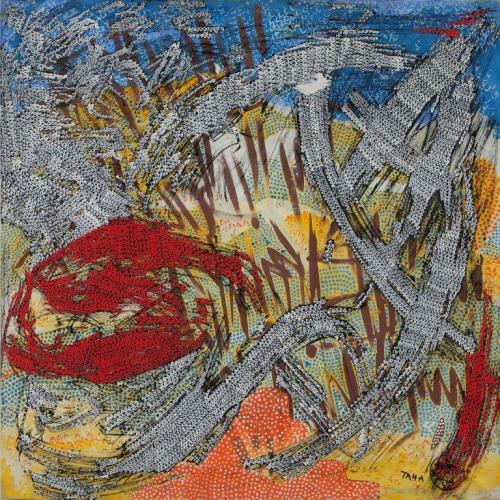 His experience in Dusseldorf motivated Hussein to abstraction. He immediately understood that it is not useful for him as Egyptian merely to follow his German colleagues, but he needed rather to find a similar objective or universal informal painting through his own cultural background. In the 1980’s Hussein found his path while creating strong idiosyncratic paintings, founded in his profound understanding of Sufism. 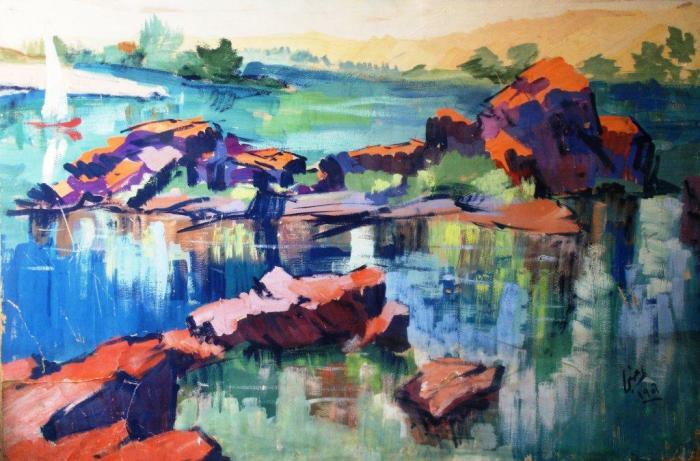 His inspiration at this time came from nature, from structures of stones, water and plants. 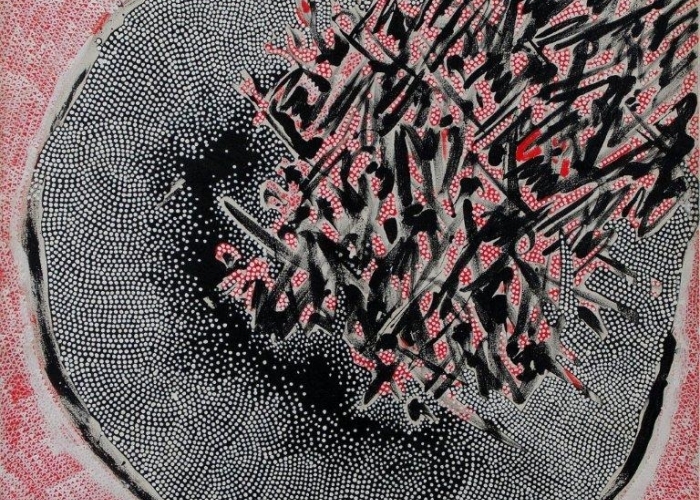 These works are made up of contrasting dots, strong geometric signs, symbols and calligraphic slashes. It makes sense to know that these powerful works were created by an artist from an Islamic country, although the artist could also have originated from Asia. These works demonstrate the power of manually painted calligraphy, which is on purpose unreadable, and as such a basic universal human expression that, instantaneously and pure visually, provide a sense of meaning. 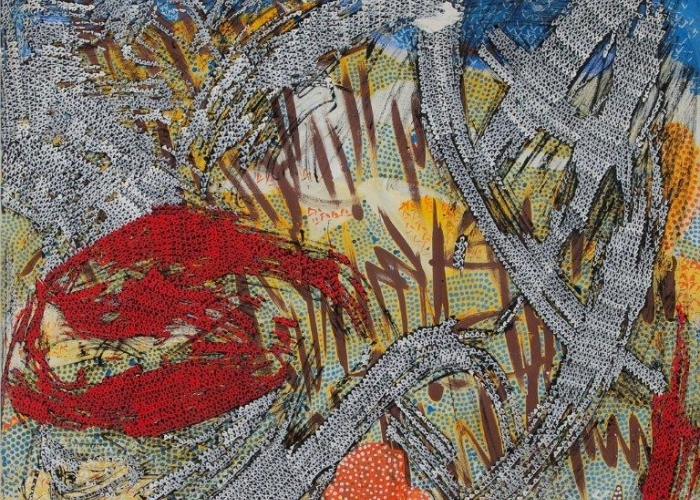 At the age of eighty-six the artist is propelling his creativity to yet another level of powerful and dynamic abstraction. The paintings that are presented under the label “Pulsatio” (Latin for heart beat) in a natural way build on the impressive earlier Basmalah works. 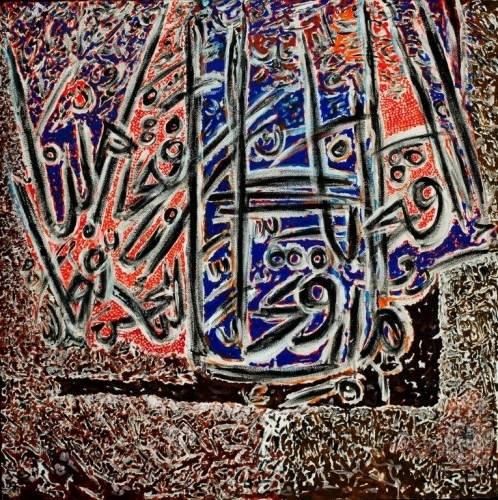 With strong brushstrokes indicating not more than a hint of Arabic calligraphy, these works are even more about the continuous and compelling pulsating forces of life and nature, Powerful and colorful breathings of life. The hand-ordered compositions evoke the visual sensation as if one is looking at rough edged and abstract particles streaming and exploding in many directions, or if still some shapes are looming. Shapes that occasionally could be the dim outline of a human being, or part of a tree or the surface of water shimmering in sunlight. But it is not clear yet if they will become actual shapes. The strong loose forms provide the impression as if the compositions are dissolving, or, to the contrary, are clustering into becoming. This is emphasized by Taha combining larger and small, thicker and thinner forms, providing an interesting spatial dimension and allowing a pulsation between foreground and background. A push and pull force more complex than painting in the 1950’s. These complex and contradicting impressions, exemplifying the sensation of life’s pulsation, cause a natural and pleasant bewilderment in the viewer. While one cannot know what one is looking at, one cannot help noticing the sheer viewing of these paintings gives a strong and pleasant feeling. In my opinion the best socio-political meaning of art is art providing another person an experience that will help that person to cope with his/her own life. An experience evoked by just looking, allowing your eyes and brain to roam. 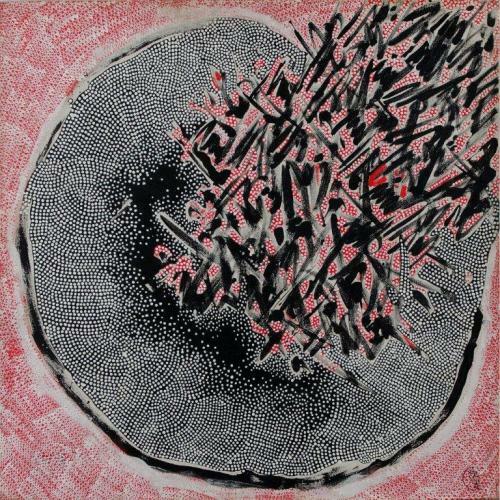 Mohamed Taha Hussein’s new works certainly belong to that category. Artist, theorist, author of “ARTIST& The Hypothesis of Bodiness”, 2014. As artist Ilgen participates in the 56th Biennial Venice 2015. 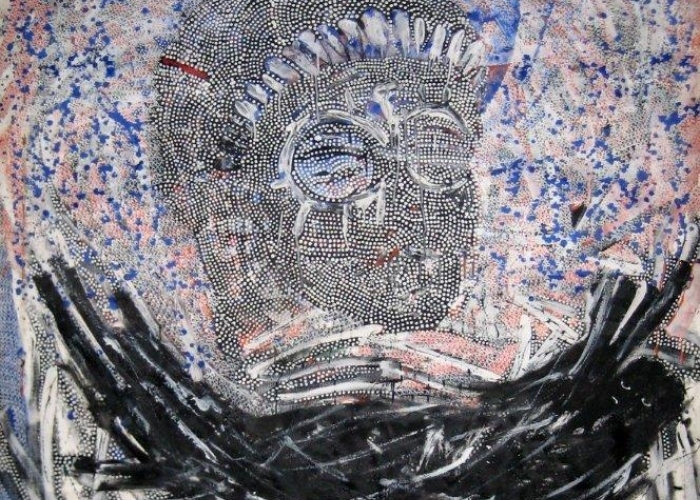 In 2008 he participated in the 11th Cairo Biennial. Mohamed Taha Hussein was born in Gamalia on the 14th of February, 1929. He was raised in the historical districts encompassing the environs of El Azhar and Sayedna El Hussein mosques. Both areas are rich with Islamic architecture and centers of cultural activity as places of religious and political discourse, with its richness of social and political traditions, political pulse, and human behavior. So he lived in a unique atmosphere of a special place among the Arab world which inevitably contributed to the depth and religious references in his art while. Having excelled in drawing at school, earning affectionate nick names as “the teacher of drawing” , where he was trained with the finest Art teachers at that time. All this led to Taha Hussein joining the Applied Arts Royal college, and completed his studies 1951 top of his class, gaining his path into Arts which he is still continuing it till today through lecturing at the University – applied Arts College, and painting in his Country side Atelier among the greenery breeze which he always says the charge of his soul. He left Egypt to Düsseldorf in 1957 to continue his studies in Arts , along with other colleagues such Adam Henien , architect Ahmad Abdoun , Maher Raef and others , later after finishing his post graduate studies , then he got his PHD 1963. Taha Hussein got many honorable rewards for his life achievements in art, and still lecturing at the university although he will reach his 80th year next February 09. 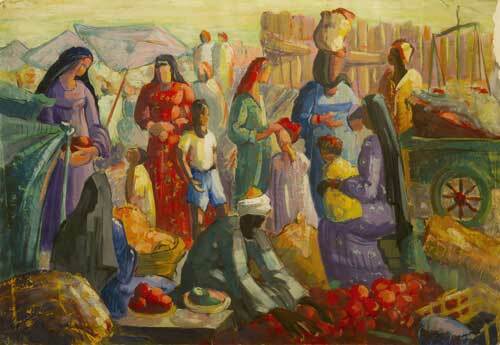 His Art Experience in abstraction started after his 50’s period when he could have called such the Egyptian George ROAULT, using thick features lines to figurative painting featuring life in the country side, swiftly moved to his continuous journey into calligraphy Art, which he is still painting till today. Taha Hussein is a versatile Artist, the witness to that is his magnificent artworks of Paintings, Sculptures, pottery, Hand Tuft Art Carpets, and batik. 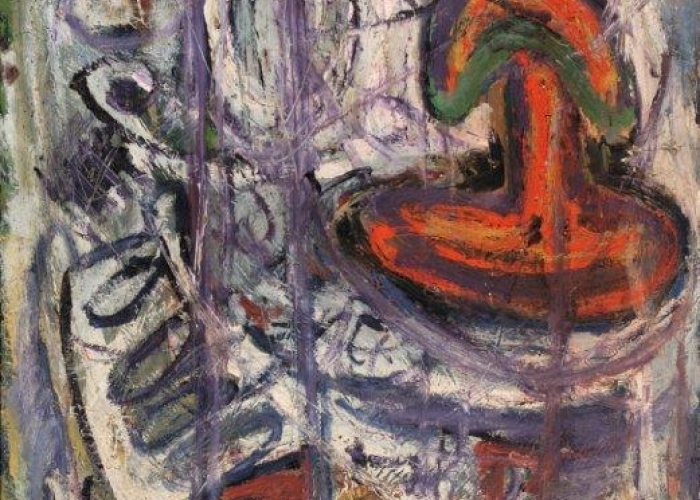 Taha Hussein Recently had a major retrospective Exhibition of his work form the 50’s till 2009 at his Representing Art Gallery/ Agent – Al Masar Gallery for Contemporary Art in Cairo last February 2009 for the occasion of the Artist’s 80th Birthday. Thursday 27th of June, the Committee of the Supreme Council for Culture voted for M .Taha Hussein one of the Honourable Nominees for Arts to grant the refined Mubarak Prize for Arts | 2009. Al Masar Gallery has the pleasure to announce, that last Thursday the Great Pioneer and Modern Egyptian Artist DR. Taha Hussein, who is a Landmark Artist of Al Masar Gallery was granted the 2009 Mubarak Art Prize in Cairo, Egypt. Dr. Taha was not only exceptional among the nominated figurers, but also got the majority of the Jury votes for his side, whereas he received 36 out of 41 votes. Soon after he has been in 2010 nominated to represent the Egyptian Art of writing among the finest world artists working on this theme, such exhibition took place in Wiesbaden Museum, and has been inaugurated by the President of Germany. Professor Artist. Muhammad Taha Hussein is currently living and teaching in Cairo.